As Believers we are required to be the Lord’s faithful followers while in the world. As devoted servants we are committed to be the Master’s diligent servant all our life. As Christians we are pledged to be Christ’s steadfast soldiers to our life’s end. From the first act of believing faith to the last breath of mortal bodies.. we are to be diligent stewards of His manifold grace. From the moment of rebirth we entered into a ‘covenant’ with Him. We reckoned His promises true as we trusted in His love.. and thus became “accepted in the Beloved” – and thus were regarded as loyal servants of the King. And to each servant the Lord gives gifts which He expects to be used to His glory. To some He gives a leadership gift to be exercised in public ministry and service but to most He bestows the quiet endowment for the hidden life of helping others. To each He entrusts His talents.. to be used in His service, as He wills. Each gift has been chosen with His infinite care and His limitless love. The work He gives to each of his stewards is selected, sanctified and suitable for each one – for each is appointed his own unique task.. be it the daily round or the preacher’s soapbox. God is no respecter of persons and each servant is precious in His sight. God Who made and saved us, also appointed us our assigned and suitable duties. 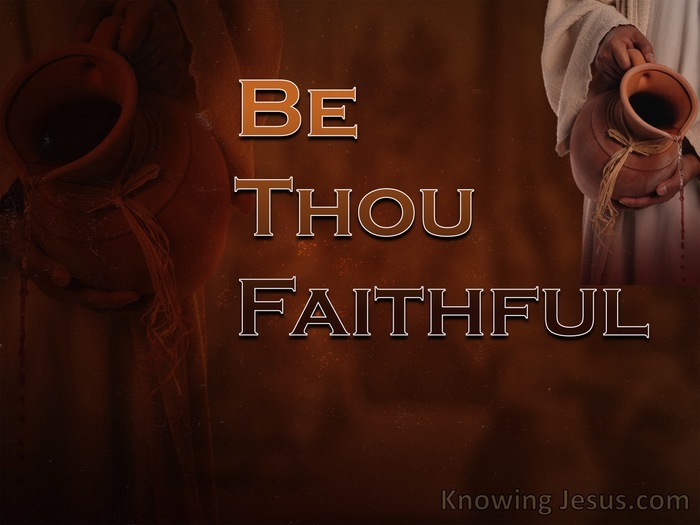 Be faithful to discover, carry out and fulfil the tasks.. that He has appointed to you. Just as I must be faithful to discover and to carry out to completion the responsibilities and tasks that He has entrusted to me. Each duty is fitted into the complex service of the Church of God.. while we are here on earth. Each work is bestowed on us, by Him.. Our work is not chosen by us for our own gratification. We may be assigned a vast ministry; a high public profile – the ear of many. We may be given one small vital task in the service of one another.. thoseHe places in our path. But the task He gives and path He chooses is unique for you, as it is for me. Each is to remain steadfast in his appointed place. Each is to continue loyal to her allotted task. This life is not easy for the faithful servant.. for we live in a world system that is not our home – this is satan’s domain. Jesus trod this way before us.. this path of bitter weariness. He too endured a life of shame and suffering. He lived a life of pain and rejection.. And WHY? He did it to show us HOW to live the life of a faithful servant – in this world system.